I tried the following experiment. But to my surprise, the program launches! The reason I'm surprised is because I've searched through all the directories in the PATH variable for the exe file called 'winword' but all my searches came up empty! I've therefore concluded that the command prompt must have known to search in places other than those specified in the PATH variable to look for executables. Well, not surprisingly, Audacity launched. What I want to know is where exactly does the command prompt look for executables? Why is it that winword.exe launches even when the directory containing it not part of PATH, but the same thing isn't true for audacity.exe? I tried other applications too. Chrome and Firefox works when I use the start command. The reason winword.exe worked is that a registry key exists which defined the path to Microsoft Word (Winword.exe). A similar key exists for Firefox.exe and Chrome.exe if those applications are installed. What I want to know is where exactly does the command prompt look for executables? System PATH Variable, User PATH Variable, and the various keys within ..\App Paths. 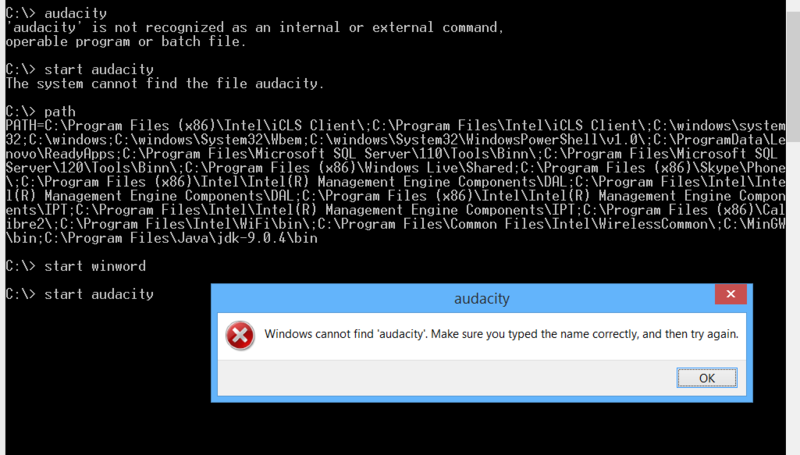 I was able to confirm that Audacity does not create a key for itself when it's installed. From the command prompt, if you just enter WinWord it fails to run. If you enter START WinWord it runs. The Start command is key here. WinWord is in that registry key. The key is there to keep PATH from getting too long. Using this knowledge (especially the last one) you can create your own aliases convenient for you. For example you can create HKCU\Software\Microsoft\Windows\CurrentVersion\App Paths\au.exe with default value of C:\Program Files (x86)\Audacity\Audacity.exe and start this application simply by typing start au in command prompt. While the other answers are likely to be the specific reason in your case, there is also another answer to your question which could have been the case for some other applications: in the same place you were looking, but with different file extensions. You specifically said that you were searching for files with extension exe. Windows will also attempt to execute files of other extensions. Another environment variable that comes into play when executing a command is the variable PATHEXT. This is a ;-delimited list of file extensions to attempt to execute. If you echo PATHEXT you might see something like .COM;.EXE;.BAT;.CMD;.VBS;... (etc.). Some applications use these other file types as their end-user entry point. It is much less common, but it happens. I have used several major commercial products which start from .BAT scripts. To use one of them as an example, I can start it with the command standalone even though there is no standalone.exe... instead, it has a standalone.bat. start winword does not tell the command prompt to launch winword. It tells the command prompt to launch start with argument winword. Start uses its own methods to find winword. Just winword tells the command prompt to launch winword. And if you try that, since winword is not on the PATH, it doesn't launch. Not the answer you're looking for? Browse other questions tagged windows command-line environment-variables path or ask your own question. Should windows path be in all caps or normal case? Intel drivers add a lot of entries to my PATH, what can I delete?